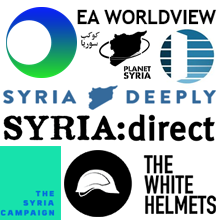 Syria Solidarity UK: What’s happened since 2013 in Eastern Ghouta? 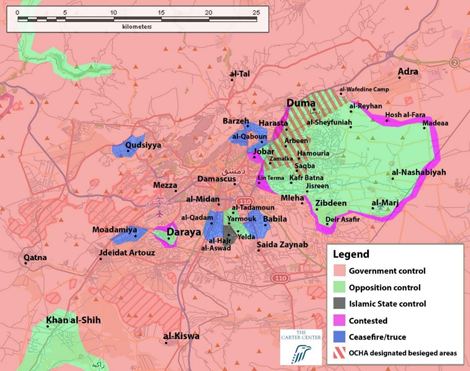 Areas of control in Damascus suburbs. © Carter Center. From Amnesty International’s report Left To Die Under Siege. Since the chemical attacks on August 21st 2013 the inhabitants of Eastern Ghouta have had no respite from the suffering inflicted upon them by the Assad regime. The siege which only parts of Eastern Ghouta had suffered since early 2013, have now become total. Food and medical aid is reduced to a trickle, and falls far short of what is needed to meet the basic needs of the besieged population. Lack of medical supplies has meant easily treatable illnesses can become a death sentence. Dozens of patients requiring dialysis have died as doctors are forced to reduce the regularity of treatments to conserve supplies. A report by the Syrian-American Medical Society , Slow Death: Life and Death in Syrian communities under siege, documented over 200 civilians who have died from lack of medical supplies over the past 2 years. Hospitals are targeted regularly by the regime. The Medical Director of the hospital in the town of Erbeen reported they had been attacked 10 times in the previous year, killing two nurses and badly damaging the facility. Earlier in August, Amnesty International published a detailed report on the siege and regime war crimes in the region. The regime has subjected the towns and villages of the Ghouta to regular bombardment, sparing no part of the area. In May 2014 a warehouse housing humanitarian aid was deliberately targeted by the regime, killing several civilians and aid workers. Over 500 civilians have been killed between January and June this year from regime air strikes. Schools, markets, hospitals; the basic services required to sustain life are all attacked. The aim is to make the situation unliveable and break the will of the population to resist the regime. On August 16th the regime again bombed the central marketplace in Douma. Over 100 were killed, and over 500 wounded. Several salvos were fired, the later ones timed so they would hit those trying to rescue the wounded. The dire situation has lead to the phenomena of ‘bucket children’, groups of children who roam Eastern Ghouta scavenging and begging for food. With their parents unable to provide for them and little or no educational facilities, scavenging has become a way to pass the time, and perhaps secure at least one meal. In the situation of lawlessness and dire poverty, these children suffer high levels of abuse and labour exploitation, as well as the everyday risk of death from snipers, barrel bombs or shells. The residents of Eastern Ghouta still participate in the resistance to the regime. The town of Saqba has a Friday demonstration every week without fail. The demonstrations range from a few hundred of several thousand at a time, and are used to demonstrate their opposition to the regime, and to place demands on the armed groups of the opposition. The armed opposition is not spared criticism by activists in Ghouta. The armed factions in the region, most prominently Jaysh Al-Islam lead by Zahran Alloush, have been accused of monopolising food and oil supplies, driving up the price and aggravating the situation for the already impoverished residents. As well, hundreds of civilians have been detained by the armed groups. These detentions spurred three days of protest in June across Ghouta as thousands took to the street demanding the release of the detainees, the improvement of living conditions and the fall of Zahran Alloush. The situation in Eastern Ghouta is a scandal and demands action. Join the demonstration on August 22nd to highlight the continued suffering of people in the Ghouta. 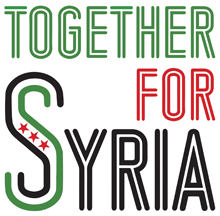 Across Syria between 650,000 and 1,000,000 are trapped in nightmarish conditions, subject to siege and warfare. They need our support now more than ever. 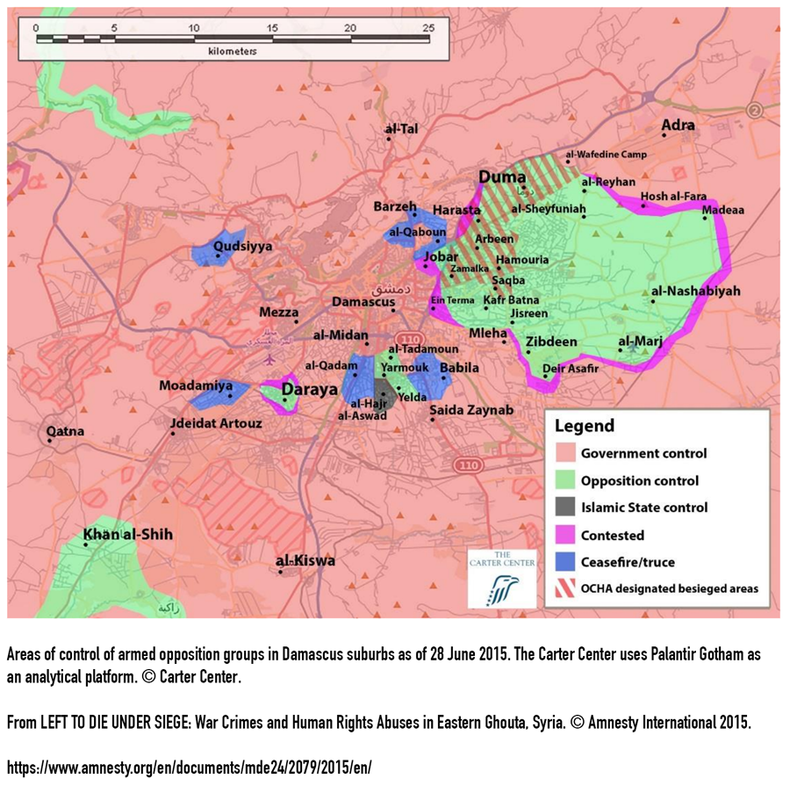 Syria Relief: Al Ghouta Under Siege, 2 June 2015. Médecins Sans Frontières‎ UK: Medics under bombardment struggling against the odds, 11 February 2015. Syria 1st-Hand: The Siege of Damascus Suburb of Douma, Channel 4 News report and tweets by Lindsey Hilsum, 29 March 2014. Through the Camera’s Lens, a Snapshot of Life in Ghouta, by Katarina Montgomery, Syria Deeply, 29 January 2015. Doctors Describe Public Health Nightmare Amid Constant Threat of Attack, by Katarina Montgomery, Syria Deeply, 12 March 2015. Damascus suburb hit by poison gas remains cut off, besieged, by Roy Gutman and Mousab Alhamadee, McClatchy DC, 12 June 2015. Comment: Syria's civilians have been left to die under siege, by Kristyan Benedict, Amnesty International, 12 August 2015. Assad Walls Off the Besieged Damascus Suburb He Gassed in 2013, by Michael Weiss, The Daily Beast, 12 August 2015. Surviving Will, on the Assad regime’s ongoing violence against civilians in Douma, filmed in February 2015 by New Horizon Team. On Saturday 22 August we will mark the second anniversary of the chemical weapons massacre in Ghouta, Syria. We will assemble at 2pm in Trafalgar Square, before walking to Downing Street. Please bring flowers to mourn the dead.